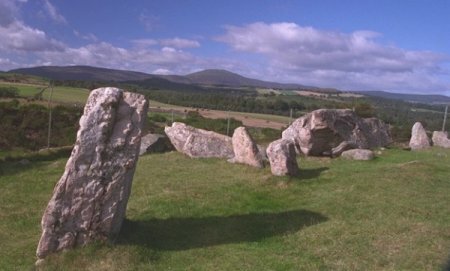 Easier to get to is the Tomnaverie stone circle just outside Tarland to the south of the B9094 Tarland/Aboyne road. The circle sits perched precariously above a quarry, a sheer drop on two sides necessitating a sturdy fence. Five of Tomnaverie's 12 white stones remain standing, a wide internal ringcairn kerb shows clearly in the grass. The best thing is the glorious view of Morven, Clachnaben and cairn-covered Balnagowan Hill, which is well worth exploring.